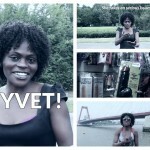 These are some of the highlights of the series featuring Yvet. Yvet is one of a kind. She always get people talking. Yvet is never afraid to speak her mind even on controversial issues. She is frank and funny. Well the bad news is; Yvet needed a long break to get some other things done. The good news is: She is coming back soon! Watch her make her comeback on Africa Web TV with a twist!